A Remake of the beautiful 17th Century Tapestry. This was made during the peak of the Aubusson rise, most likely by a Flanders refugee. It depicts the haughtiness of soldiers. Ornately adorned, with the belief that Angels will be protecting them, and with a doctor to amend their every minor injury, meanwhile, they fail to notice the common man arming themselves in the background. It is wrapped in the standard floral cascade of the Aubusson design. A more modern example of Aubusson tapestry. This was designed in Aubusson for the Industrial Exhibition of 1844. This piece shows the variety of skills found in Aubusson throughout History. This piece was complete by a weaver who had deeply studied both eastern art and philosophy. 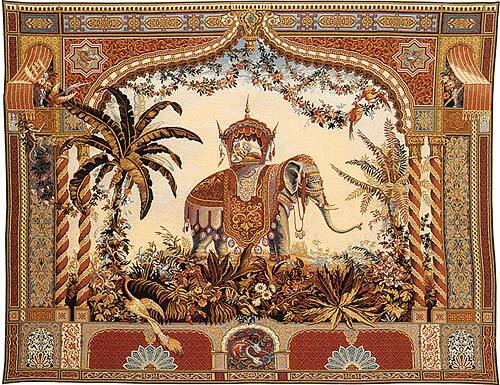 The woman in the Howdah is a character from Hindu Literature as well as the bird located on the left. It also features the foliage outline expected from Aubusson, but this weaver gave a beautiful twist by adopting oriental foliage such as the lotus into his pattern. Tapestry has always been a different form of art. While paintings always carry high aesthetic value, the use of tapestries for basic insulation of mideival stone structures made it a more routine and somewhat less spectacular piece of art. It is similar to modern day Architecture. Architecture in the current era is widely considered beautiful, yet you rarely see people spending hours studying the beauty of a building. This is because, despite its beauty, a building is a practical object meant to be used and only briefly observed. Historically, Tapestry had this precise role. While many beautiful tapestries were made prior to Aubusson, they were made to blend in and provide a warming comfort. This goes back to the Renaissance mind set. During the Renaissance, we saw a rise of sculpture and painting to the prime spot as premier works of art. In the meantime, tapestry experienced a lagging phase. Throughout the 1200's up to the 1500's, the oil on canvas or fresco styles of painting mostly dominated the market and became the "definition of art". The Rise of Aubusson in 1580 completely turned this around. The 1500's is known as the end of the Medieval times and the beginning of the Reformation. However, the Reformation was for much of the world, a much more bloody time than they had ever seen. The French Wars of Religion were the climax of this transition phase prior to the true reformation. In 1580, the city of Flanders became a hotspot of fighting which led to an exodus of the many artisans that populated the city. Aubusson was a small weaving town that drew the eyes of many of these artisans because it was viceroy-governed and therefore not a part of the war. The extremely skilled hands of Flanders arrived at Aubusson to find an astounding amount of material and some gorgeous scenery waiting for their skills. 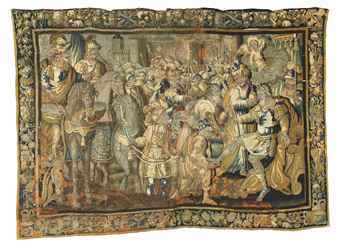 This boom lasted through the 17th century and during the 17th Century, the Aubusson Workshops were granted Royal Appointment with all the protection and large contracts that this included. In 1790, the French Revolution was in its full throes which had destabilized the entire region. Weaving began to loose some of its profitability as the Nobility had been significantly weakened. The middle class had not grown enough to afford such lavish decoration and the nobility had other focuses such as defending their titles and as such, the prices of these tapestries dropped heavily. This time saw the creation of wall paper and insulation as a possibility for keeping the home conditioned outside of the lavish tapestry. Throughout the 1790's wallpaper became the standard among even the nobility and tapestry slowly came to a standstill. The capability of Aubusson did not reach maximum again for roughly 120 years. In 1901 Aubusson saw another massive boom that was a complete revival of its once great industry. In our era, tapestry is again considered artwork and as such, Aubusson has been a central source of some of the most famous tapestries of the 20th century. A recent discocery made in Florida in the home of an elderly French man is shaking up the entire Aubusson landscape! Read More! Home Decor Item of the Week! 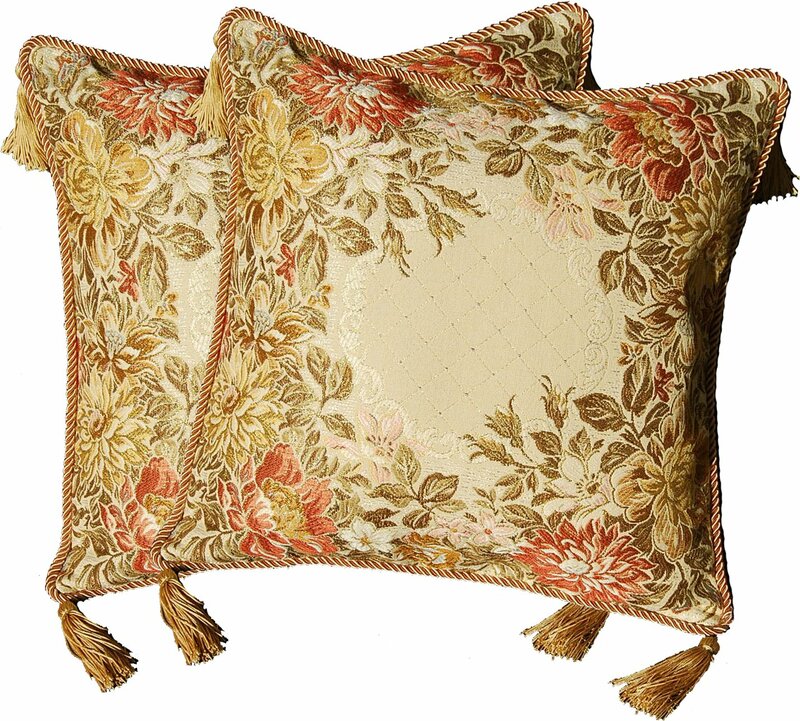 These decorative pillows feature hand woven designs of the Aubusson nature. It has a specific focus on floral designs. Elegant yet simple. Heavily discounted if you use our link! Tapestry Item of the Week! An absolutely gorgeous tapestry. Meant to be hung in a proud spot in your home or to give your office an awesome upgrade, this tapestry is large and beautiful. Give your mantel the look it deserves. This beautiful 7' x 10' Classic Aubusson rug is deficiently worthy of another glance! 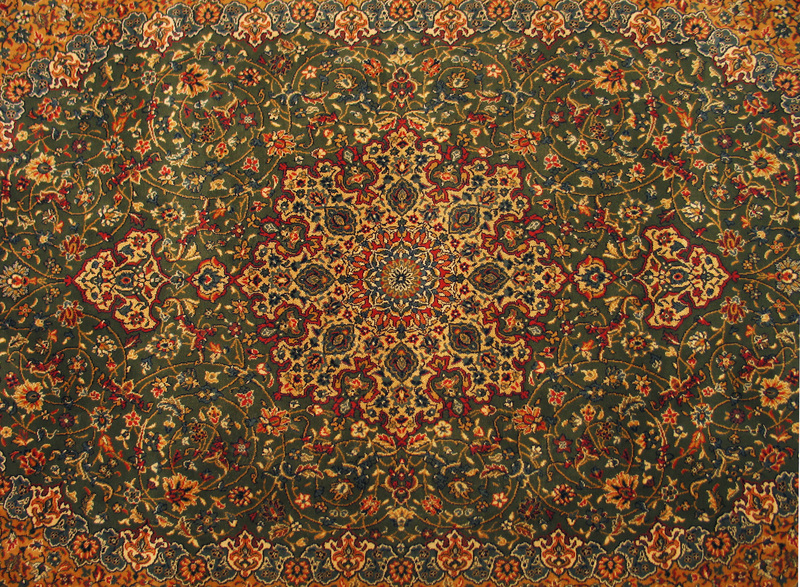 It has all of the traditional designs expected of a much more expensive rug but is significantly more affordable. It has all of the Classical foliage designs of the Aubusson Rise. Unique Item of the Week! This is an oriental variety from the workshops at Aubusson This particular rug is dated back to the 1870's as Aubusson was returning to power. This seller has lots of other options as well! © 2014 Aubusson-Tapestries. All Rights Reserved.